Soothing Touch Brown Sugar Scrubs will give you the luxurious feeling of being pampered at a world-class spa. And, every time you open the container, the delicious scent will make you think you have been transported to some exotic locale! The base is formulated with an Ayurvedic blend of oils (Almond, Safflower, Sunflower, Avocado, Grapeseed, & Apricot Kernel), 100% organic brown sugar containing AHAs that remove cellular debris, and vitamin E for its healing, antioxidant properties. To this are added tantalizing essential oils for a nearly intoxicating scent! This delightful scrub nourishes at the same time it exfoliates so that your newly-revealed, younger skin looks and feels silky smooth and radiantly lovely! Recommended to use for exfoliation & to remove oil from the body. Choice of cranberry, vanilla-orange, mango ginger, desert blossom*, chocolate peppermint, french vanilla latte and Rest & Relax (16oz only). Available in 16 oz and 2 gal containers unless otherwise stated. *Note: The manufacturer changed the name of this product from Desert Bliss to Desert Blossom in March 2008. No other changes were made. Orange Vanilla Brown Sugar Scrub - With sweet orange and tangerine oils, this scrub is fantastic as a full body smoother. 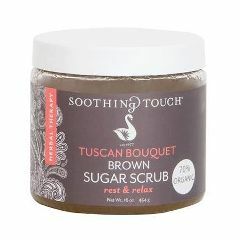 Soothing Touch Brown Sugar Scrub gently exfoliates old dry skin away from the surface and helps lock in vital moisture needed to keep your skin looking young and healthy. After just one use your skin is left feeling soft, silky smooth & visibly radiant. Mango Ginger Brown Sugar Scrub - Fantastic as a full body smoother with Ginger oil, this Brown Sugar Scrub gently exfoliates old dry skin away from the surface and helps lock in vital moisture needed to keep your skin looking young and healthy. Mango Ginger is our Tropical Oasis blend, Sweet and Spicy. Say Aloha! Desert Blossom - This treatment creates harmony within the body to allow harmony to manifest outside as well. Nourishing oils deeply moisturize the skin and leave a shine. This neutralizing treatment has a delicious fragrance and leaves skin smooth and stabilized. Chocolate Peppermint- This scrub contains natural cocoa, peppermint oil, and brown sugar, which helps to even skin tone and allow for gentle exfoliation. The synergy of essential oils and brown sugar lock in moisture, firm the skin, diminish the appearance of fine lines and wrinkles and leave skin silky smooth. Tuscan Bouquet(Rest and Relax)- Organic Brown Sugar, Expeller Pressed Sweet Almond (Prunus amygdalus dulcis) Oil, High Oleic Expeller Pressed Safflower (Carthamus tinctorius) Oil, High Oleic Expeller Pressed Sunflower Seed (Helianthus annuus) Oil, Grapeseed (Vitis viniferia) Oil, Expeller Pressed Apricot Kernel (Prunus armeniaca) Oil, Expeller Pressed Avocado (Persea gratissima) Oil, Tocopherol (Natural Vitamin E), Lavender Essential (Lavandula angustifolia) Oil, Chamomile (Anthemis nobilis) Essential Oil, Bergamot (Citrus aurantium bergamia) Essential Oil, Sandalwood (Santalum album) Essential Oil, Vanilla (Planifolia) Essential Oil, White Rose (Rosa centifolia) Essential Oil, Infusion of Kava Kava Root (Piper methysticom), Valerian Root (Valeriana officinalis), Yarrow Flower (Achillea millefolium).